Not sure if you saw this or not, but Sir Richard Branson's Virgin Galactic company cleared a major hurdle on Sunday in their quest to bring space tourism into reality. A pair of Virgin pilots navigated the first-ever commercial space craft to a safe landing in the Mojave desert. Now, the craft did not ever reach outer space, but it did glide safely from a "carrier ship" in the same manner that the space shuttle did decades ago during its initial development and testing. If they can stay on schedule, Virgin plans to launch the first "space tourists" into outer space within the next two years. As I read this, I could just imagine myself hurtling through space, just like my heros of the space race did. But then I saw this line: "Each [tourist] will pay $200,000 for the ride and train for at least three days before going." Houston, we have a problem. I can probably handle the three day training, but $200k for a vacation is a deal killer. So where's the space junkie to go without breaking the bank? How about Florida's Space Coast? You won't technically find any such place on a map, but most of it is in Brevard County and contains both the Kennedy Space Center and Cape Canaveral Air Force Station. The former is famous for launching NASA space craft, including the space shuttle, while the latter launches civilian and military satellites. Some of the towns and cities that make up the Space Cost are Titusville, Rockledge, Cape Canaveral, Cocoa Beach, Melbourne and Palm Bay. Bordered to the south by the Treasure Coast, the Orlando metro area to the west, and the Atlantic to the east, it is an ideal spot for any Florida getaway. But getting back to space travel, the Kennedy Space Center is the best place to get started. The inspiring exhibits and hands-on experiences include: The Apollo/Saturn V Center, which recaptures the events of the space race and moon landing eras; IMAX theaters, where you can feel the thrill of space exploration on five-story screen; and, guided behind-the-scenes tours of the working space flight facilities. But that's just for starters. There's also a Children's Play Dome, a Hubble Telescope Exhibit, the Space Shuttle Plaza, the Astronaut Hall of Fame, the very touching Astronaut Memorial, and something they call the Rocket Garden. No it's not where they grow the rockets, as I learned, but a dramatic display of the actual rockets used to propel astronauts into space, splashed with dramatic red, white, and blue lighting and set to patriotic music. But my favorite attraction by far, is the Shuttle Launch Experience. It's a six-story replica of the actual space shuttle facilities. After a crew briefing, visitors are strapped in for the sights, sounds, and sensations of a real space shuttle launch. Man that's cool, and it's included in a very reasonable general admission ticket. So it will save you a couple of hundred grand over the Virgin Galactic route, which you can use to rent a timeshare. 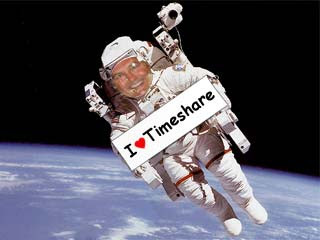 While on my space odyssey, I am renting a timeshare at The Resort on Cocoa Beach, right on the famed Cocoa Beach itself. It's a beautiful resort, which RedWeek members rate 5-stars. The resort offers a heated pool, tiki bar, interactive children's fountain and playroom, exercise room, basketball and tennis courts, an elevated jacuzzi overlooking the resort's dramatic fountain, and a 50-seat movie theater. You can get all of this, and possibly witness an actual space shuttle launch, for just $107/night. Are you kidding me?! Well I am off to explore the home of another of my passions. The Ron Jon Surf Shop is the most famous chain of surfing stores in all of the world and, as luck would have it, their flagship store is right here in Cocoa Beach. The store's motto is "One of a Kind," and at more than two acres it is the largest single venue for surf wear, sportswear, and beach gear anywhere. You see, I have been hanging ten since before Gidget and the Big Kahoona were even in diapers. Don't know what that means? Neither do I really, but suffice it say that I am an old surfing nut, and if you've never been to a real surf shop, add Ron Jon to you bucket list. Mahalo, over and out.